According to its 2018 review, both exports and imports grew by 7.9% and 10.6% respectively. Oil trade rose 16.8% in 2018 amidst higher oil prices, whilst non-oil trade grew 7.3% in 2018. Non-oil domestic exports (NODX) rose by 4.2% in 2018, following the 8.8% increase in 2017. Higher exports of non-electronic NODX (9.2%) outweighed the decline in electronics (-5.5%). Domestic exports of non-electronic products grew by 8.2% in 2018, following the previous year’s 9.2% growth. The largest contributors to the rise in non-electronic NODX were food preparations (+109.1%), pharmaceuticals (+24.4%), and non-electric engines & motors (+64.3%). Non-oil re-exports (NORX) grew by 8.1% in 2018, extending the 5.5% increase in 2017. Electronic re-exports rose by 1.9% in 2018, following the 7.5% growth in 2017, on higher re-exports of ICs (+3.2%), telecommunications equipment (+10.3%), and capacitors (+24.6%). 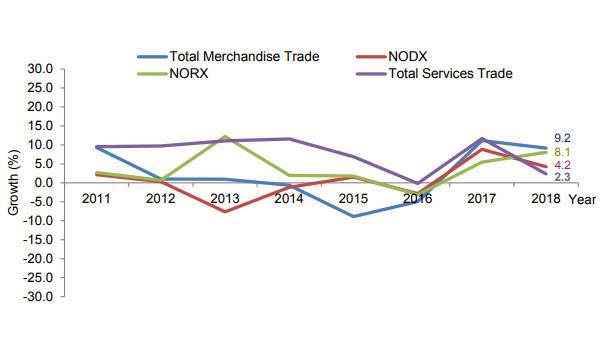 Non-electronic NORX expanded by 14.4% in 2018, extending last year’s 3.5% increase, on higher re-exports of non-electric engines & motors (+85.5%), aircraft parts (+23.6%), and personal beauty products (+29.6%). Meanwhile, non-oil exports (NOX), which include both NODX and NORX, grew by 6.5% in 2018, following the 6.8% increase in 2017. NODX to the top markets as a whole grew in 2018. Growth was led by the US (+38.2%), the EU 28 (+15.7%), Japan (+11.4%), and Indonesia (+11.3%), which outweighed the decline for China (-8.8%), South Korea (-17.6%), Hong Kong (-3.9%), Taiwan (-4.5%), Malaysia (-0.9%), and Thailand (-1.3%). According to ESG, pharmaceuticals and general manufacturing should support exports in 2019. “Overall, total trade and NODX growth are expected to moderate in 2019, easing from 2018 and 2017's rapid pace,” it said. Singapore’s key trade partners such as China, ASEAN-5, the Eurozone, the US and NIEs are expected to grow, though the pace is likely to moderate from the performance in 2018 and 2017. “Downside risks such as negative effects of tariff increases enacted in the US and China, waning growth momentum, and tightening financial conditions may also weigh on global growth and trade flows. Meanwhile, oil prices declined since the last update,” said ESG. Meanwhile, SIngapore services trade rose 2.3% and reached $500.4b in 2018, as both services exports and imports grew 4.1% and 0.6% respectively. Services exports increased by 4.1% in 2018, following the growth of 9.9% a year ago. The growth in services exports can be attributed to the increase in receipts from other business services (+5.5%), transport services (+2.4%) and financial services (+3.8%).